Kim Jong Kook is a south korean singer and TV personality. He was born in 25 April 1976 and his home is at Anyang. He was born in an ordinary family where his father was from the military. His family members include his father, mother and a elder brother. During interviews, he mentioned that his father was a very strict disciplinarian and a man of few words. Kim Jong Kook mentioned that he is frugal in his spending and he actually learned that characteristic from his dad. 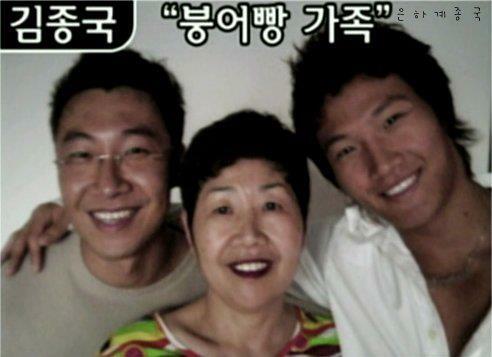 Kim Jong Kook mentioned that he love his mother the most because he had seen how his mum suffered silently. Kim Jong Kook elder brother was better in his studies as compared to him. His mother often worries about her youngest son Kim Jong Kook. The only thing that he does well is singing and he often sing rock songs when he was a teenager. Feeling motivated, Kim Jong Kook decided to join singing auditions but his high pitch voice was pretty strange at that time. Therefore, his family were initially not very supportive of his decision to be a singer. Despite that, his mother stood by his side and encourages him. Kim Jong Kook elder brother is Kim Jong Myung. He is a plastic surgery specialist and during an interview, he revealed that his little brother has help him pay for his tuition fee while he was studying medical. Basically, they have a close relationship and Kim Jong Kook was always proud of his elder brother. I read an article when his brother asked Kim Jong Kook to do double eye-lid but Kim Jong Kook did not do so as he is afraid of the pain. Nonetheless, I am glad that he did not go ahead with that suggestion as I really like Kim Jong Kook puppy small eyes. He even joked about his small eyes and relate an incident where he was watching a moive in the airplane. An air stewardess came by switches off the TV thinking that he had slept. However, he was actually wide awake and was shocked that the air stewardess suddenly switch off the TV. To prevent embarrassment, Kim Jong Kook pretended to sleep. Not only that, Kim Jong Kook was pretty well known in his High school at Anyang. He was an influential person who had the nickname,"Axe Kim". Apparently it is because he is good in fighting. According to his friend in high school, he mentioned that the teacher appoints Kim Jong Kook as the class monitor for self studies classes is because of this reason. However, instead of studying hard in school, Jong kook only overlook the class without even putting any effort in his studies. His friends even revealed that Kim Jong Kook always like to hang up at KTV with his friends. His theory is to study for an hour, go to KTV and rest till the next day. That is playing and learning at the same time. Kim Jong Kook likes to wear mustung jacket at that time because it looks cool. He cherished his leather jacket so much that he choose not to participate in a fight with his friends. Instead of helping his friends, he pretended not to see and ushered his girlfriend away. During the show, Kim Jong Kook even revealed that his first girl friend in high school was actually dating another person from the swimming club. Because of that he was being confronted about this matter. However, the matter was settled peacefully at the end. Anybody knows that Kim Jong Kook was once approached by the gansters to join in their gang using handphones and cars as temptation? Fortunately, Kim Jong Kook rejected the offer as he thought about his future. Around that time, his mother fall seriously ill and Kim Jong Kook repented and promised to keep out of trouble. Gradually, his mother condition gets better. He is filial to his mother and often bring her around places. Kim Jong Kook had a secret crush on a girl during his school days. He met her in a bus and he often tried to be in the same bus as her. However, he was too shy to approach that girl until she transferred to another school. During the program, his secret crush appeared on TV and reveals that she is a Turbo fan but she has no recollection that they often board the same bus. This girl has grown up and was married. Therefore, it became part of Kim Jong kook beautiful memory. At the age of 20, Kim Jong Kook formed a idol dance duo Turbo with another member Kim Jung- Nam. They produced many hit songs such as Black Cat, Jazz Bar and My Childhood Dreams. They debuted in 1995 and their popularity lasted till early 2000 Kim Jong Kook talked about how they were abused and threatened while they were in the Management agency during the famous Talk show - Strong Heart. Basically they have no rest and their schedule were all packed to milk in every cents they are worth. Kim Jong Kook even suffered an injured back disc due to his constant dance practices. Unable to tolerate anymore, the duo left the agency and went into hiding. It was reported in Korea news that they suddenly went missing. They retaliate to the ill treatment by the agency through their own ways. They even refused to bow after a performance in Japan which led to controversy. Anybody wonders why Kim Jong Kook have more muscles now compared to his Turbo days? He revealed that he took up boxing to protect himself if the agency gets people to attack him. That is part of the reason why he was suddenly buffed up with a muscular body. Eventually, Kim Jong Kook returned to the agency and reach an agreement with them. He tried to rope Kim Jung-Nam in but he was too disappointed in the Entertainment circle and refused to come back. Left with no choice, Kim Jong Kook called for an audition to replace the rapper position. His then management agency wanted Kim Jong kook to take the responsibility if this project fails. Kim Jong Kook took up the responsibility to re-establish Turbo and called for the audition. There was a guy named Mikey which caught Kim Jong Kook attention. He said that Mikey may not be the most handsome guy but he is good in rapping. Therefore, they formed Turbo and release a few albums with classic hits such as December and Twist King. However, turbo disbanded when they were still popular and they left the Management agency. Mikey went back to America. Kim Jong Kook was left without a partner and became a solo artiste. His first album did not do well and he was demoralized. At that time, he was set up by someone influential in the entertainment industry. song writers were told not to give him any song and opportunity in the Entertainment industry. Feeling upset, he drank with his buddy Chae Tae Hyun and even cried during his most difficult time. His second album does pretty well with the titled classic hit - One Man. Suddenly, he became well known and his following albums does well in the music chart. Through this experience, Kim Jong Kook shared that he will never look down on anyone no matter what. In 2005, Kim Jong Kook won the grand awards (Daesung) in all the TV station. His song - Loveable was well recieved by his fans. Subsequently, he ventured into variety shows such as Family Outing and Running Man and have been doing well. Soya is daughter of kim jong myung?? Is it true? I was amazed to know that behind those heart breaking kdramas was him singing those beautiful songs...first tine i saw him i thought he was a wrestler, never did i thought that he is a great singer...fell inlove with his songs years ago...falling inlove with him just recently when i saw running man and #spartace...haha he is indeed a true inspiration esp to those whos life was in torment...he should be invited as a motivational speaker more often...esp to the universities which we all know how hard the struggles of the students are.